A tremendous amount of data is created on the SI-Mesh network. From the live reports of sensors, to periodic firmware update scans, data is always flowing throughout SI-Mesh. To be useful to you, this data needs a home where it can be stored and simply presented. That’s why we created SI-Dash, our custom dashboard for for all this data. 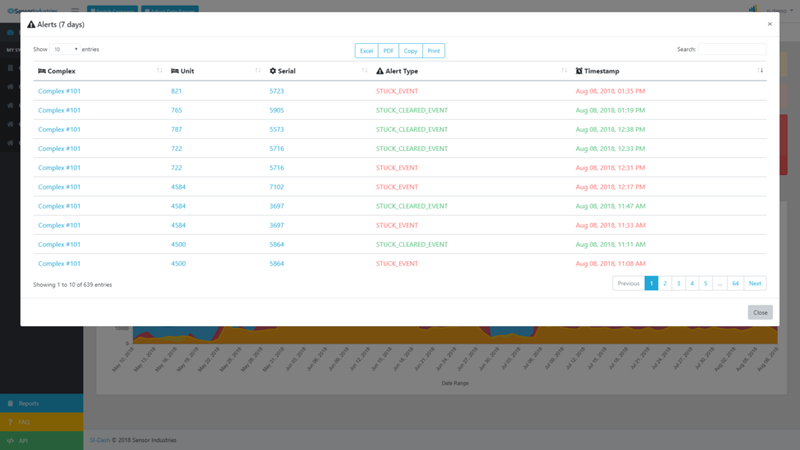 SI-Dash provides an infinite repository for everything your sensors report back. It isn’t enough to simply store your data though, it has to be presented in a way that actually helps you. This is where our advanced algorithms come into play. 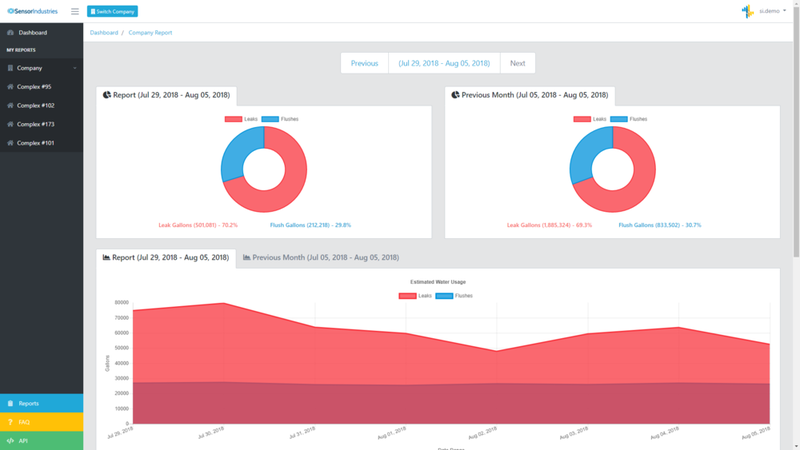 SI-Dash identifies trends and events within your data and presents them visually for you to easily understand. We’ve seen a lot of dashboards, most either focus too much on the small data points or they extrapolate beyond what is reasonable and don’t provide direct access to data. We aim instead provide both the macro and micro views of your data in a simple and consistent manner. The raw data, as your sensors report it, would be far too much to consume manually. That’s why SI-Dash’s algorithms process this automatically, sorting all your data into a human readable presentation. Every time you log in you’ll have a visual representation of this data with any issues highlighted for your attention, requiring a mere glance. If you decide you want to dive deeper into your data you can jump right to the complex, unit, or even the specific sensor all in a single click. Every page on your dashboard follows the same formula. Glanceable information, a visual representation, and action items. All that changes is the scope of the data you are viewing; Your entire portfolio, a single system installation, a single unit, or an individual sensor. Glanceable information updates dynamically, changing color based on severity, the chart gives you a historical view of your data, and action items can be downloaded or printed as a work order for your staff in a single click. We value user customization. We know everyone has a different use case and their own preferred ways of navigating an interface. We built SI-Dash with this in mind. There are multiple paths to walk through every page, tables can be filtered in any way, and you can the easily contract or expand the scope of viewed data. Every table we provide can be one-click exported to Excel, PDF or printed. Allowing seamless portability of the prefiltered, analyzed data. And if you want to do even more or simply have your own in-house solution to manage it, we provide an API allowing you to process the raw data on your own. Our WaterR8 sensors are attached to the fill line on each toilet, granting them direct access to monitor water usage for each unit. When the toilet fills after a flush, it is reported. When the toilet tops off from a small leak, it is reported. When the flapper valve is stuck open and water is pouring out, it is reported. SI-Dash sorts all of this data and presents it graphically for you to understand in a glance. Each problem unit is identified individually so you don’t have to waste any time trying to find the specific source of the problem. One of the most important services Sensor Industries provides is Active Notifications. When our algorithm recognizes an event that requires immediate attention it instantly notifies you or your designated maintenance personnel with the location and urgency of the problem. This allows you to head off leaks, floods, and stuck opens. Stuck open leaks are more acute in nature and most of the time require a maintenance person to see the stuck leak in action to easily determine the problem. We provide a complete log of these alerts on SI-Dash anytime you want to check up on who is receiving what.